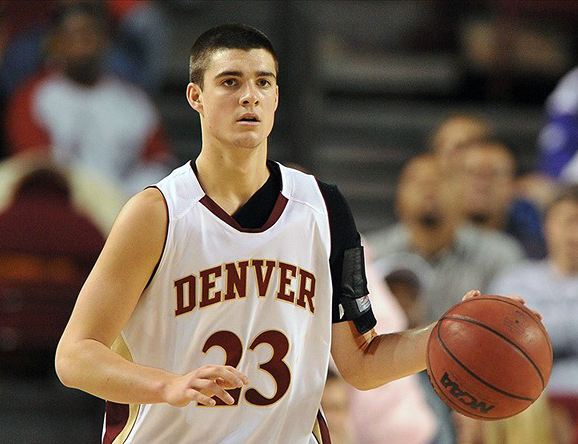 DENVER – Brett Olson (Highlands Ranch, Colo.) scored 19 points, dished out five assists and grabbed four rebounds as the University of Denver men’s basketball team was victorious 88-74 over the Omaha Mavericks Saturday afternoon at Magness Arena. The Pioneers (10-13, 4-6 Summit League) snapped their three-game losing streak while handing the Mavericks (8-14, 2-9 Summit League) their fourth straight loss. The Crimson and Gold avenged its earlier loss at Omaha by using a balanced scoring attack in the victory. Cam Griffin (San Antonio, Texas) returned to the starting lineup for the first time in four games, scoring 18 points and pulled down nine rebounds. Denver opened the second half on a 17-6 run to give them a 59-32 lead before Omaha tried to make it interesting with their full court press. The Mavericks were never able to get closer than 10 points. Nate Engesser (Colorado Springs, Colo.) scored 19 points and tied his career-high with six assists, while Jalen Love (Wichita, Kan.) poured in 16 points and five assists. The Pioneers starters shot an incredible 76.5 percent (26-of-34). “I thought another big thing for us was that for the first time since November 30th we had our starting lineup out there that we had at the beginning of the year,” Scott said. Denver shot 69.0 percent (29-of-42), to Omaha’s 48.1 percent (25-of-52) from the field. The Pioneers made 50.0 percent from behind the 3-point line (8-of-16). The Mavericks shot 33.3 percent (4-of-12) from 3-point range. Daniel Amigo (El Paso, Texas) scored six points, tied his career-high with three assists and blocked two shots. Bryant Rucker (Frisco, Texas) scored five points in eight minutes off the bench. The first four minutes of the first half featured back and forth action with Omaha leading 10-9. Over the next four plus minutes Denver went on a 14-0 run to open up a 23-10 lead. The Pioneers red-hot shooting continued throughout the half as they led by as many as 21 points. The Crimson and Gold took a 42-26 into the locker room. Denver was led by Olson who scored 12 points and grabbed two rebounds. Griffin scored eight points and grabbed six rebounds, while Love scored eight points and dished out three assists. The Pioneers had 13 assists on 15 made first half field goals and outscored the Mavericks 18-10 in points in the paint. Denver shot 71.4 percent (15-of-21) from the floor in the opening 20 minutes. The Pioneers hit for 54.5 percent (6-of-11) from behind the arc in the first half. Omaha shot 40.0 percent (8-of-20) from the floor. The Mavericks shot 25.0 percent (1-of-4) from behind the 3-point line. Notes: The 42 points tied the most points scored in the first half by Denver this season. They also had 42 against New Orleans. Coach Scott team’s improved to 20-1 when scoring 80 or more points. The Pioneers finished the game with 23 assists on 29 made field goals. Denver will continue their homestand when they take on North Dakota State Thursday, Feb. 12 at 7 p.m. MT. The game can be seen on ROOT Sports with Vic Lombardi and Greg Lackey on the call. The game can also be heard on Mile High Sports Radio AM 1550 FM 94.1|96.9 in Boulder with Raj Sharan on the call.